In the wake of the wrongful and contrived arrest/imprisonment of England’s Tommy Robinson to silence his loud and powerful voice speaking truth about the danger of Islam, these two brave women believe the best place to sound the alarm is in the United States. As a well-known British media figure and businesswoman, Katie Hopkins speaks openly about the threat of Islam to liberty in Europe. In Europe today, however, any speech which offends muslims is not welcome and not legal. For her truthful discussions about Islam, Hopkins was fired from her TV and radio shows, let go from her writing gigs at newspapers and other publications, and was directly threatened by jihadis trying to kill her. While all of this unfolded, a play opened in Wales entitled, “The Assassination of Katie Hopkins” with no condemnation from the British government. Elisabeth Sabaditsch-Wolff is the daughter of an Austrian diplomat who lived in Iran before, during, and after the 1979 Iranian Revolution, and who found herself in Libya on 9/11/01. Wolff began giving public presentations about the basics of Islam in her home country of Austria, including stating that Islam’s prophet Mohammad married Aisha when she was six years old, which conforms with doctrinal Islamic teaching. In 2009, Sabaditsch-Wolff was convicted in an Austrian court for “denigration of religious beliefs of a legally recognized religion,” in violation of Section 188 of the Austrian Criminal Code. The conviction was upheld by an Austrian appellate court in 2011. The Austrian courts ruled Sabaditsch-Wolff’s comments are “an abusive attack on the Prophet of Islam which could stir up prejudice and threaten religious peace,” which, by the way, is not consistent with centuries of Western law and a reasoned understanding of justice. The court ordered Sabaditsch-Wolff to pay a fine of €480 ($625) or an alternative sentence of 60 days in prison. In other words, the Austrian courts, as well as the European Court of Human Rights, are imposing the Islamic Law of Slander upon Europeans. In sharia, “Slander” is legally defined as saying/communicating anything about Islam a muslim would “dislike,” and it is a capital crime. For more about sharia, get a copy of UTT’s 2-DVD set “It’s All About Sharia” by clicking HERE. The European Court has adopted the Islamic legal definition of “Human Rights” as defined by the Islamic world under the banner of the OIC (Organisation of Islamic Cooperation). The OIC approved and served the Cairo Declaration on Human Rights in Islam to the United Nations in 1993. In it, the entire muslim world at the Head of State and King level defines “human rights” as the imposition of sharia. This past week, leaders in Fort Worth, Texas held a prayer vigil with Hamas/Muslim Brotherhood leaders at the Islamic Association of Tarrant County, exemplifying the ease at which jihadis are able to get U.S. leaders to submit to them just as leaders are submitting to suit-wearing jihadis in Europe. 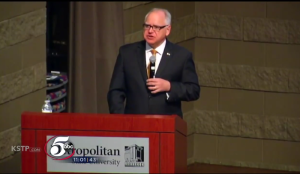 Most notably, Governor Tim Walz of Minnesota supported and defended – or more accurately “aided and abetted” – Hamas terrorists doing business as the Council on American Islamic Relations (CAIR), by speaking at a CAIR event in Minnesota several days ago. Minnesota Governor Tim Walz speaks at a Hamas/CAIR event where he defended Hamas’ and called for a suppression of free speech. Governor Walz called for an end to “Islamophobia,” a word created by the Muslim Brotherhood’s International Institute of Islamic Thought (IIIT) to be used to impose the Islamic Law of Slander on the non-muslim community. Right now American leaders – with their co-conspirators in the media – are imposing sharia and condemning free speech on U.S. citizens. America stands at the precipice of U.S. judges, courts, and leaders putting Americans in jail for speaking truth about Islam’s barbaric law called sharia. The war for liberty is happening NOW. Every time a mayor, police chief, congressman, senator, pastor, rabbi, or National Security Advisor, panders to the Islamic community, and gives in to their demands for “religious accommodation,” they are, in fact, surrendering one more foot of ground to sharia – a system that stands in direct opposition to liberty, America’s founding principles, and U.S. federal and state laws. Islam is a quasi-religious seventh-century movement empowered by a Totalitarian, Supremacist ideology and that its goal is to establish dominant rule under the leadership of a global Caliphate. Doctrinal text from the Quran and Ahadith reveals that Islam’s cult-like feature, governed by Sharia law, calls for the killing of any Muslim who converts to another faith or system of rule that allows freedom of religion, freedom of speech and freedom of critical thought. That’s practicing Islam! Islam should not be recognized as a protected “religion” under the First Amendment and should be identified as an enemy threat doctrine due to its seditious structure to overthrow all Western forms of government along with its numerous human rights violations against Muslims and non-Muslims, alike. I agree. Islam is an ideology. Mostly political and very little religious. I agree Mike, Islam should be identified as an enemy threat.since the Quran, the laws of sharia state their mission is sedition. It call for muslims to migrate to all countries of the world, cross borders, grow populations, build mosques, deceive the target country, demand and try to create laws to demand that the non believers submit or live in subjugation, they are protected as a religion, so they are able to strike terror into the population without interference and no one can connect the terror with the teachings which is their strategic goal. Muslims who strike terror are a special group, they sacrifice their lives and are told they will arrive in their version of heaven, are recognized internally but denied publicly, and if this gets exposed they create more terror and disruption. Meanwhile the base gets educated, moves into positions of government or business or medical fields and create an image of supremacy , devotion and charity it may take many generations but they work towards that goal incessantly. Anyone who fights them internally or externally face their brutal sharia laws, and the people who now live under the rules of sharia soon find freedom of speech is prohibited, all other religions will be admonished,reduced and fade off, woman are used and abused, children are used for warfare, all to take control, and overthrow all western governments with individual freedoms and rule a life of misery once the mask is off. In my opinion it is taking many cities and then states. We fight them abroad they migrate here it is senseless. Islam is jihad, to conquer. To Muslims we are pigs and apes, Muslims are superior to any non-Muslim, Jew, Christian. Muslims use lies, deception, subversion to fool Americans. Bush, Clinton, Obama all told America Islam is a peaceful religion, all these Presidents were consumed by Islam/The Muslim Brotherhood hierarchy members, CAIR hierarchy members, all negotiating in the White House with the above Presidents, many had Muslims working in their administrations. Muslim Student Organization helped empower “Islamophobia” on campuses across America. Rubio and Feinstein proposed to Congress, a bill to make it a felony to speak the truth about Islam back in 2016, it was voted down. Many leftist public school administrators promote the teaching of Islam to children. Saudi Arabia has funded the construction of mosques in America to the tune of $300 billion (? ), mosques at major intersections of every large city in the USA. So then, is the method of funding terrorism by the Islamic Association of Tarrant County, achieved through Zakat? If so, wouldn’t that constitute Material Support for terrorism? Inasmuch as most Austrians are of a Germanic line of descent and pan-continental belief that when all is said and done, “blood runs thicker than water”, many still regard Adolf Hitler as a revered native son of that country, which is where he was born. Furthermore, although said Austrian born lunatic made it clear from the outset of his diabolical world war that he intended to exterminate Christianity as well as the Jews et al, not only gave refuge in Berlin to the mufti of Jerusalem following his escape from the British for fomenting riots, but instructed his pagan head of the Nazi Gestapo, Heinrich Himmler, to collaborate with said fugitive from justice in the recruitment of Muslim jihadists into SS mountain divisions. I.e., there’s not a dimes worth of difference between Islam’s relentless war to destroy Christianity, what’s happening in the Austrian and other European criminal courts regarding freedom of speech and any decision of a U.S. federal court which effectively allows the Muslim Brotherhood & Organization of Islamic Countries to succeed in their diabolic attempt to supplant the U.S. Code with sharia law in American courts. As a matter of perfectly obvious fact, the Executive and Legislative branches of the U.S. Government are firmly in the grip of a sufficient number of political ideologues posing as federal judges determined to thwart any hope of success threaded to nationwide internal security, who live amid multiple concentric circles of high-tech security while depriving the American people of any real semblance of presidential leadership by means of demonstrable treason in time of war. Anyone inclined to review the plans Islam has in store for they and their children in connection with said war, may order a verbatim Arabic-to-English translated copy of said unspeakable evil, the original of which was seized from a subterranean basement in Annandale, Virginia by special agents of the FBI in abeyance to a federal search warrant in 2004, by simply contacting http://www.securefreedom.org to request (for a nominal handling & postage fee): GOVERNMENT EXHIBIT 003-0085 3:04-CR-240-G U.S. v. HLF, et al. Thus, given the global nature of Islam’s 14-century attempt to destroy Christianity, foregoing thesis clearly requires background awareness of Hitler’s intent from the outset of his diabolical Nazi nightmare not only to ban religious opposition, but to the literal eradication of Christianity from the face of the earth. While at the same time his pagan head of the Gestapo, Heinrich Himmler, was inducting Muslim jihadists into the Nazi waffen SS with the help of the mufti of Jerusalem who was living in Berlin after absconded from Jerusalem to avoid the service of a British arrest warrant for fomenting riots. Delete the final paragraph of my foregoing blog at 1635hrs on 04July2019; its superfluous, thus inadvertently included.